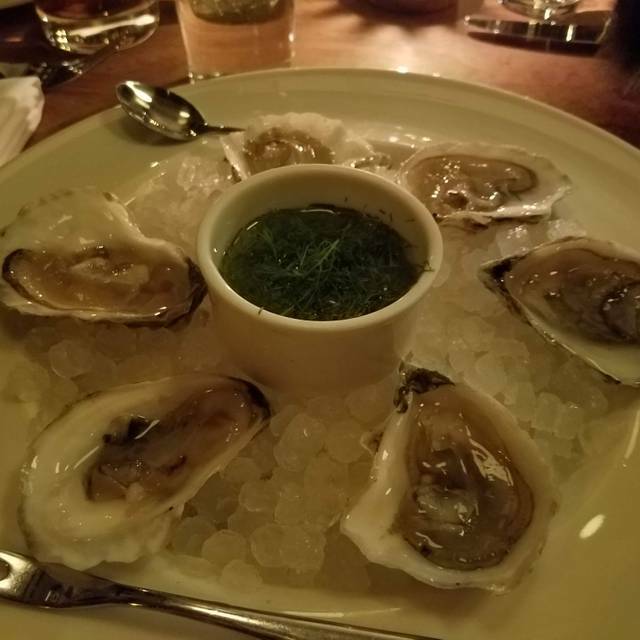 April Bloomfield's restaurant, The Breslin, offers seasonal menus which embrace nose to tail cuisine, small growers and local farmers. Seedlip spice, ginger, cucumber, lime, rhubarb bitters & thistle tonic. Place wasn’t even half full and we had to flag down the waiter just for water, for a second drink as ours sat empty for awhile. Eventually had to get the manager to tend to our table. Outstanding Business breakfast spot with a good menu for everyone. Turmeric juice was a really special tonic to get started. Great coffee. Efficient service. Will return. Food was lacking flavor, not terrible but definitely not worth the price. Service was poor, they forgot to give us our menus and the waitress smelt of body odor which was not appetizing. Cute decor in the least. Very limited menu. Extravagant prices. SUPER LOUD! Food was ok. It took 45 minutes for our food to arrive. When it did, one member of our party was not served and had to wait another 10 minutes to get her food. No apologies from staff or management. I had to get up twice to ask where our food was. Really bad form. Why, when ordering a highly priced breakfast, do you require anyone wanting eggs other than fried to order the alternate eggs as an EXTRA charge. This has never been required of me in 40 years of business travel. The tables are too small for the plates you use and the room is dangerously dark. The staff are interested. On a busy day you could ask why the restaurant was so empty. We took the Sunday Supper option, which was a good deal. The food was a very good, if mild, Indian curry with accompaniments. A litre of house red was decent, and by New York standards, not bad value at $40. It is a striking room, not too noisy and the seating is comfortable. Service was friendly but a bit slow and inefficient. Great experience however the wait staff seemed a little unorganized...when we arrived we weren't sure who to check in with, we didn't receive menus right away and then had several different people tend to us. The overall experience was still great though and the food was delicious! The food (pasta) was way too salty. The service was great, and atmosphere was lovely. Delicious aged rib eye. Amazing brussel sprouts. The scotch egg was unique. Citrus salad yummy. Rib eye is pricey but taste was on point. Enjoyed the experience. Food and service were incredible! Tuesday night @ 7:30pm. It was busy, but there were several open tables. We ordered the pasta and the lamb burger which were both great. Food took 55 minutes, not great. Mgr did give us a round but that was only after 2 words with our waiter. Even with that though 1 cocktail, 1 beer and the aforementioned food came to $126 before tip. No value here. Very long wait for food. Thought the food was ok. Not great. Crowded and noisy, most food selections exclusively for carnivores, yet charming ambiance with pubby feel. Very good service. I would go there again, for drinks. The food at the Breslin did not disappoint! And, the staff was incredible. They had great recommendations on the food and on the wine. We had a booth and felt like it was our own private event space! 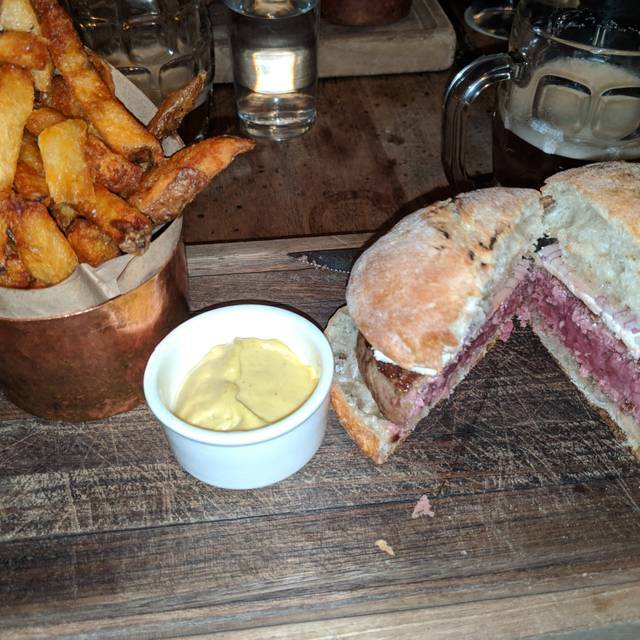 We will be back for more scotch eggs and the sleeper hit for us - the beef and stilton pie. i have been to this place many times but this latest visit was the first in a couple of years. not sure if it was an off night or if this is the new norm, but the usually delicious lamb burger was awful. i didn't finish it and left hungry. the fries were pretty good, but i remember them being awesome before. drinks were still spot on. service was ok.
Everything was really delicious apart from the pasta special which was a big disappointment. The Hungarian mushroom soup is outstanding. The rutabega mash and brussel sprouts were super good. we were a party of six - one of the people requested if they could make omelet in egg whites - but they were not accommodating in any way ; very uninspired menu with no visual eye candy- basic boring dishes/ don't look like their web pics. The service was spotty an not interested in giving us a pleasant experience. And I'm a New Yorker- not from out of town! Frankly I was embarrassed with my friends who came up from Virginia for the weekend...will never go back! What a glorious experience. A culinary treat and a truly beautiful room. A new favorite haunt for us. Had been for drinks but never a proper dinner. So glad we did. Lamb burger the way to go. A bit quieter upstairs too if you’re looking for it. Really great meals. Caesar Salad - amazing!!! Tagliatelle and lamb - terrific!!! Brussel sprouts - outstanding!!! Kabocha squash - exquisite!!! Seafood sausage - unbelievable!!! I always love eating at The Breslin. Their lamb offerings are top-notch. I had the lamb chops this time around, and they were tender, flavorful, and delicious. Strongly recommended. Awesome food and service l! Overall just kind of a disappointing meal. The menu is extremely limited with no specials. Service took forever - like 35 minutes to just get a beer. I had the braised pork - it was bland and mediocre. The Brussels sprouts and rutabaga mash were quite good. The restaurant has a very nice decor but tables are too close to each other. It was too hot on the top level. The cask beer is good but I'm tired of the pale ale trend. 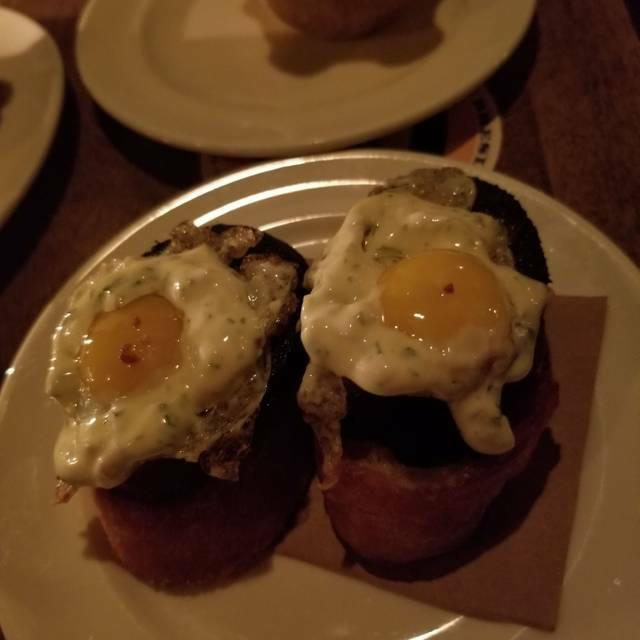 The blood sausage and scotch eggs were very good. They will not disappoint. With all the hype over the lamb burger I was expecting fireworks but instead I felt bamboozled. It difficult to consume with the bun so hard to bite through and the lack of seasoning. The feta gave the lamb a more mutton flavor profile making it very unappealing. The fries are good but the accompanying sauce was odd. Everyone has their own taste but the value to quality was hard to stomach. Best burger you'll ever eat, and I mean that. Everything else is phenomenal. Ambiance was perfect for a business meeting. Service and food were both impeccable!! It took an hour and a half to receive our entrees, server seemed put out when we called him over after the first hour to see if there was hope for us. Food was good but between the poor service and the B&T crowd we won't be back. Food is excellent but the service was very lacking. We had to ask for Menus 10 mins after we had been seated. Also, the check took a while to come (10 mins after we were done eating) and a while to process. The waiter was nice but it seemed weird since I love the food here. Everything was phenomenal— they even have phone chargers in the booths! I had the black cod curry dish and it was outstanding. Particularly liked our sommelier Zach. Very knowledgeable and recommended a wonderful wine. Perfect for a dead of winter evening with friends. 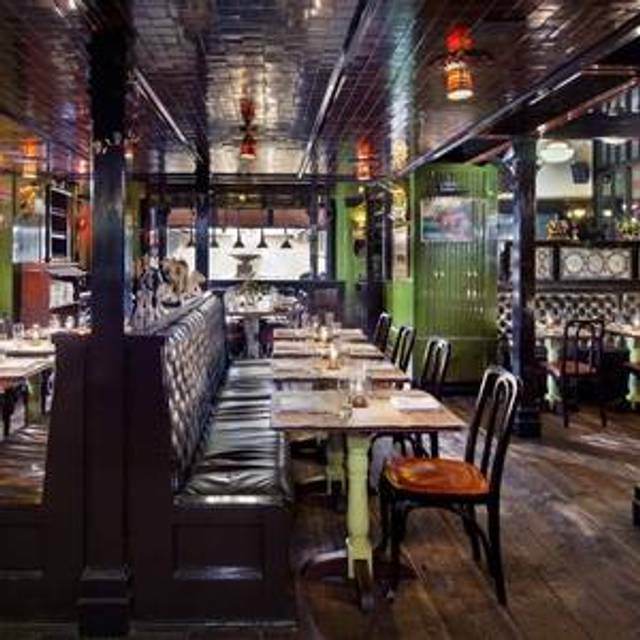 Ask kindly for one of the cozy blanketed booths and the powers that be may grant you your winter wish. Even the food is cozy. Bon apps! I was disappointed in the food, especially given the price. I thought the menu was lacking and also the food was very salty. I wouldnt go back here. 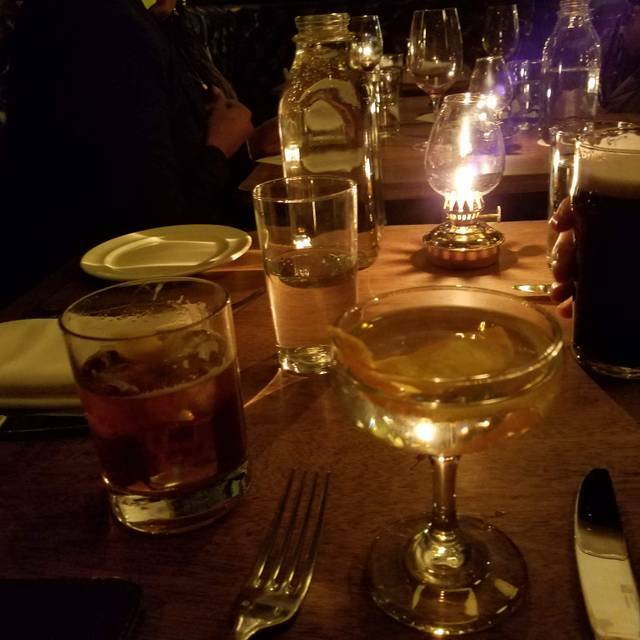 Great drinks, great food and very good service. My only issue was the noise level. Between the music and the crowd noise, I could barely hear the person sitting directly across from me. Food was amazing. I had the Scottish Egg and the Lamb Burger. My wife had the egg salad toast and the Skate. Everything was so good! 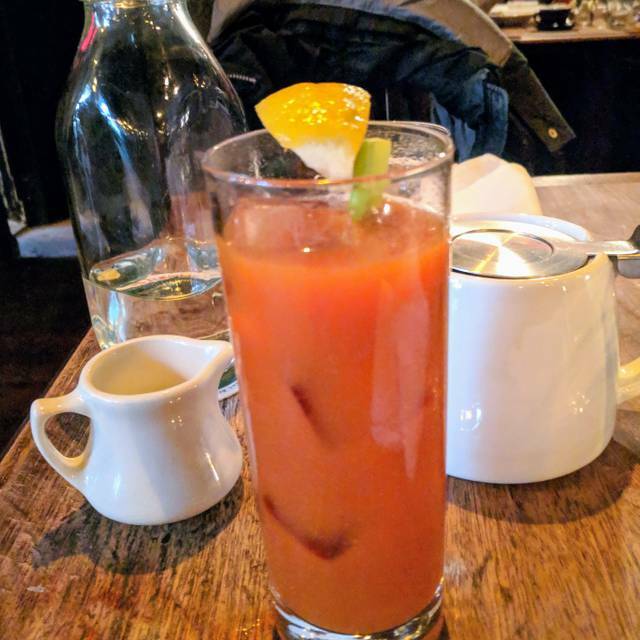 Brunch review - we were disappointed with the food. The service was fine.